My father used to work for a big factory, “a city within a city,” as it used to be referred to by locals. As a kid, I remember visiting him in that huge red brick industrial complex. I saw it it as a beautiful and magical place. Twenty some years later, it is sadly just another abandoned industrial site in the middle of the city. While for me it holds sweet childhood memories, for thousands of people who pass it daily, it carries different emotions. They would describe it as messy, ugly, abandoned, neglected, unlivable, unnatural, or even useless. I couldn’t help but wonder if these and other man-made structures are misjudged. Perhaps they are just a glance away from being full of potential opportunities for living creatures other than us, other than people? We live in the Anthropocene era, a time named for the significant impacts of us humans on Earth’s geology and ecosystems. Our population has been rapidly growing, while also advancing technologies and expanding the areas we occupy. In doing so, we’ve shaped existing habitats as well as created new unique environments, such as urban and industrial areas. Many of these developments have resulted in the reduction of biodiversity (biological diversity of living creatures), which is essential for the ecosystem health and provision of services and goods that people and wildlife reply on (for example, clean air from trees, pollination of crops by bees, meat from wild animals). But what if, as we’ve been “progressing”, nature has been adapting and “joining” us in the man-made environments? Industrial sites are heavily modified man-made structures. As in the case of my home town, many have been abandoned and are now viewed as lifeless. However, this is far from the case; in a recent study, Daan J.E. 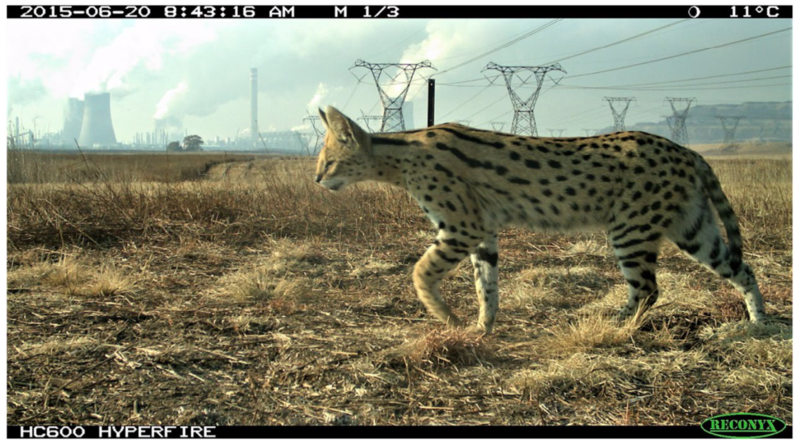 Loock and colleagues used camera trap surveys to assess the density of serval (Leptailurus serval) at the Secunda Synfuels Operations plant in South Africa. The serval is a cat-like medium-sized carnivore that feeds primarily on rodents and is typically found in wetland habitats. These habitats are decreasing globally and the species is particularly vulnerable to industrial development. Unsurprisingly, serval have declined throughout their range and is listed as near threatened in South Africa. This is not the case in urban areas, though: the study showed that servals occurred at higher than previously recorded densities, presumably because of high abundance of prey and absence of competitor species or persecution. Urban areas usually consist of small and poorly connected patches of habitats suitable for different living organisms, for example, ponds in parks, or groups of trees, lawns and others. Because of their man-made history, people often think of them as “unnatural” and only useful for people. This sentiment is debunked, however, by recent work by Kylie Soanes and her colleagues from the University of Melbourne in Australia who reviewed scientific literature on levels of biodiversity in different urban habitats. They argue that urban environments are not as much of a lost cause as they are perceived to be and have the potential for conserving biodiversity. Indeed, several studies showed that many species can reside in urban habitats, and even small patches such as ponds or single trees can provide a refuge for nature. For example, Beat Oerti and colleagues have found a greater number of species in small ponds in Switzerland than in a single large pond of comparable total area. A group of researchers in Australia led by Dave Kendal have assessed a network of urban grasslands and found unique speciesno found in large nature reserves. According to a study by Nicholas Williams and his colleagues in Australia, the nationally vulnerable grey-headed flying fox (Pteropus poliocephalus) taken to urban street trees and is now growing in numbers. A study in Singapore by Meryl Theng and colleagues showed that smooth-coated otters (Lutrogale perspicillata) have re-established resident populations along the urban coastline after a 30-year absence. These examples give hope and demonstrate that man-made structures do not have to be marked as “suitable for people and their activities only”. There are opportunities and space for welcoming and sharing our unique habitat with other living creatures, who also seem to be on the same page with this message. Theng M. & Sivasothi, N. (2016) The Smooth-Coated Otter Lutrogale perspicillata (Mammalia: Mustelidae) in Singapore: Establishment and Expansion in Natural and Semi-Urban Environments. IUCN/SCC Otter Specialist Group Bulletin. 33(1):37-49. https://bit.ly/2EZ4u6P. ← Will sea level rise harm tidal marshlands? Warding Against Wildfires: How Well Does it Work?